Vancouver, British Columbia - November 8, 2018 (Newsfile Corp.) (Investorideas.com Newswire) ML Gold Corp. (TSXV: MLG) (FSE: XOVN) ("ML Gold" or the "Company") is pleased to report that it has extended the open-ended mineralization at the Tana Zone on its Stars Project in central BC, Canada. Vein-hosted and disseminated copper mineralization has been intersected in Holes 11, 12 and 13 (DD18SS011-013) which were drilled as 100 metre step-out holes from the previously reported hole 10. Additional assays from holes 14, 15 and 16 (DDSS18014-016) are currently being processed. The Stars Property is ideally located 60km southwest of the resource town of Houston, B.C. The project site is low-elevation, gentle topography, and is accessible by all-season main line resource roads making it ideal for low-cost open-pit mine development. The Tana Zone is located on the eastern flank of the large 5-kilometre-long magnetic ring anomaly centred within ML Gold's Stars Property. The zone of copper mineralization occurs within and adjacent to a magnetic low and remains open to depth and along strike. Copper mineralization has been directly related to feldspar porphyry intrusions with zones of increased potassic alteration typically making up the central portions of the mineralized intervals. Observations of the potassic alteration indicate that the mineralization is "leaking" from a larger source. These observations include high grade potassic breccias cemented with chalcopyrite (copper). The main rock units present are altered feldspar-phyric porphyry intrusions cutting hornfelsed and silicified Hazelton Group volcanic rocks. The newly discovered porphyry unit has now been observed in six separate drill hole at the Tana Zone. ML Gold Geologists have noted many similarities to the Huckleberry deposit in regards to the lithology and mineralization styles. Hole 11 (DD18-SS011) - Hole 11 was drilled 100-metres east of the previously reported Hole 10, which intersected 405 metres of copper in a steeply-dipping mineralized zone. Hole 11 intersected similar volcanics with intercalated porphyry intrusions resulting in two separate mineralized intervals (91 metres @ 0.25 CuEq from 75.29 to 166.73 metres; and 106 metres @ 0.22% CuEq from 218.54 to 325.22 metres). Hole 11 successfully identified the eastern extension of the Tana Zone along a km-scale linear magnetic low feature. The Tana Zone remains open in multiple directions. Hole 12 (DD18-SS012) - Hole 12 cut two separate intervals of copper mineralization (21 metres @ 0.17% CuEq from 47.85 to 69.19 metres; and 40 metres @ 0.19% CuEq from 105.77 to 145.39 metres). Hole 12 intersected pervasive phyllic, Quartz-Sericite-Pyrite "QSP" alteration representing high-level alteration of a porphyry system. Hole 12 was drilled 100 meters southwest of the Hole 10 and was also successful in intersecting mineralized feldspar porphyry intrusives cutting hornfelsed and silicified volcanics. Hole 13 (DD18-SS013) - Hole 13 cut a large interval of copper mineralization with numerous higher grade sub-intervals (73 metres @ 0.30% CuEq from 54.25 to 127.41 metres; within 183 metres @ 0.25% CuEq from 8.53 to 191.41 metres). Hole 13 intersected abundant disseminated and vein hosted copper mineralization contained within and proximal feldspar porphyry intrusions cutting pervasively silicified and hornfelsed volcanic rocks of the Hazelton Group. Hole 13 was drilled steeply from the same collar location as Hole 12 in the opposite direction to test the mineralization below the extensive QSP alteration observed in Hole 12. 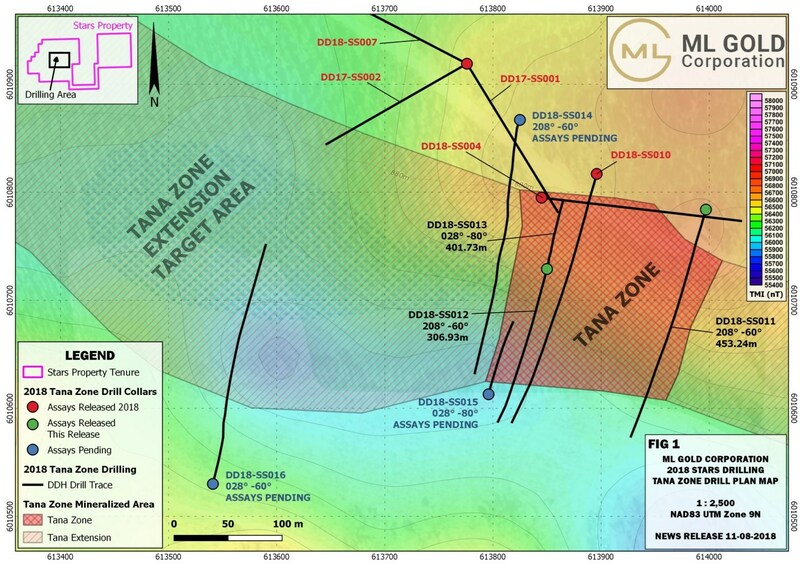 The Tana Zone remains open along strike and at depth where additional drilling is being planned to test this theory. A larger drill will be needed to fully test the depth potential at the Tana Zone. The Stars property is host to multiple zones of copper mineralization with roughly 90% of the property remaining untested under glacial till cover. The property covers a large (~5km diameter) magnetic ring feature interpreted as a hornfelsed volcanic contact surrounding a monzonitic to dioritic intrusion centred within the project area. Later hydrothermal fluids and mineralized porphyry intrusions cut through the large monzo-diorite intrusion and surrounding volcanics. This secondary alteration and emplacement resulted in variable magnetic destruction of the hornfels volcanic rocks and possible increased magnetic susceptibility of intrusive rocks. Several primary geophysical targets remain to be tested on the property. All drill core was logged, photographed, cut and sampled by ML Gold personnel. Prior to shipment to MS Analytical's sample preparation facility in Langley, B.C., certified reference material standards and blanks were inserted at a ratio of approximately one in every 10 drill core samples. Base metal assays are determined by IMS-230 4-acid digestion with ICP-AES/MS finish method, which reports results as parts per million (ppm). All analyses that reach the overlimit of IMS-230 are reanalyzed with an ore-grade method. The analytical results are verified with the application of industry-standard quality control and quality assurance procedures. The gold assays are determined by FAS-111 fire assay method which reports results in parts per million (equivalent to grams per tonne). Any samples with a fire assay that report gold concentrations equal to or higher than 10.0 g/t Au are analyzed by metallic screen method (Au-SCR24).